SAN DIEGO — There’s a pretty good chance that if you’re not wearing reading glasses to read this review, don’t read newspapers or have the slightest clue what the letters AARP stand for, then you probably have no idea what a Toyota Avalon is — let alone have exciting thoughts about trading your current ride for one. That’s because average age of a current Toyota Avalon buyer starts with the number six. But that isn’t stopping the folks at Toyota who aim to knock a decade or so off the median age of the owner by introducing the fifth-generation 2019 Avalon sedan. First introduced in 1994 as a 1995 model, Avalon was, for the most part, a stretched version of Toyota’s V-6 Camry sedan. In fact, since its inception, the Avalon has been built on the same assembly line as the Camry at Toyota’s massive Georgetown, Kentucky, manufacturing facility. It has large doors that open wide for ease of ingress and egress for the senior crowd, a floaty boat-like ride, couch-like seating front and rear, along with styling that, while attractive, plays it safe by not attempting to be anything even closely resembling avant-garde. The recipe for the Toyota flagship sedan was simply this: attractive, comfortable, spacious and quiet. Mission accomplished. But Toyota knows their market of baby boomers — born between 1945 and 1964 — is dwindling. With the new fifth-generation Avalon driven here, they make makes no secret about looking to attract younger buyers who also want all this practicality served up with ample helpings of technology, an increased dynamic and responsive driving experience. They also care about styling, and while the last generation Avalon was certainly an improvement over those that came before, the new 2019 Avalon knocks it out of the park; it could easily pass for Lexus, especially when viewed from the side. The new Avalon abandons the soft, curvy style from previous years, giving way to more sharply chiseled lines and creases along the side and rear, with a single swoop of a roofline. But no review of the new Avalon is complete without a few words regarding the outrageous styling of its massive and polarizing “cowcatcher” maw up front. For those who find the current Lexus “spindle grille” hideous, it’s more than safe to say you’re not going to be fan of what Toyota affixed to the front of the Avalon. My limited driving of the Avalon at its launch in Del Mar, Calif., a few weeks ago was subject to several unsolicited words of scorn from the unsuspecting. It’s less in-your-face on the XLE and Limited trim models – thanks to the chrome border that spans the fascia – than the piano black mesh on the sportier XSE and Touring models. Aside from the grille, all is not lost up front. Its all-aluminum hood gives way to the attractively slim, LED Vision Tech headlamps employed by the XLE and XSE trim grades, which use a cluster of three reflectors for Daytime Running Lights (DRL) and low-and high-beam functions. The upscale Limited and Touring models get adaptive LED cornering lamps that point into turns, corners and curves, and with seamless activation, fades in and out, adding 60 percent more foreground low beam visibility. It even self activates when changing lanes or when reversing. We also liked the new Dynamic Auxiliary turn signal, both front and rear, that increase visibility by activating each diode in sequential fashion, rather than all on, all off. The hallmark of the Avalon has always been its large, roomy and premium interior and that space really shows up in the stretch-out rear seat. The look of the interior is certainly conservative and void of curvy design elements. It’s rather straightforward, with the dash bisected by Avalon’s thin nine-inch floating multimedia system (MMS) displaying audio and navigation, and integrating the climate control system. 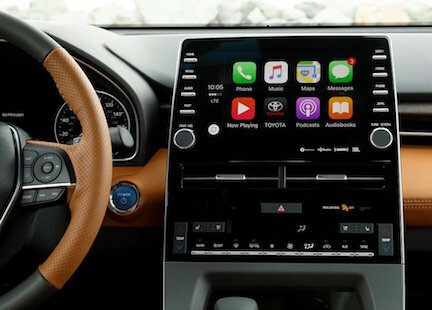 Avalon will also feature Toyota’s first integration of smart watch or Amazon Alexa-enabled device connectivity, as part of Toyota Remote Connect. The feature allows drivers to lock/unlock their doors, start their engine, or check their fuel level, all from their smart watch or Amazon Alexa- enabled device. It’s voice controllable too, and compatible with select Android or Apple devices. And, for the first time, Apple CarPlay is now offered. However, for some unknown reason, there is Android Auto is still not available. What hasn’t changed for Avalon is the V-6 engine, standard since the 2005 model. It is a 3.5-liter rated at 301 horsepower, up 33 horses over the outgoing 2018 model. The engine is connected to a new eight-speed automatic transmission that performed superbly during our drive routes. Complementing Avalon’s attempt to lower its average buyer age is an array of first-ever available sport-oriented tools like adaptive variable suspension, an intake sound generator for exhaust baffling and engine sound enhancement, giving a sense of a sporting performance sedan. There’s even four-level drive-mode selection – Eco, Normal, Sport/Sport+ and Custom – available on the Touring trim. To be sure, regardless of trim level and available sports-oriented features, the new Avalon is not a sports sedan, with its highest objective still roomy comfort. Along with the available XLE, XSE, Limited and Touring trim levels for the new Avalon is a hybrid in XLE, XSE and Limited trims, being offered for a bargain price of just $1000 over the conventional V-6 powered drivetrain models. As astonishing as the small premium for the hybrid is the fuel-economy estimate of 43 mpg city and 44 mpg highway on the XLE hybrid, with 43 mpg city and highway on XSE and Limited trims. That significantly improves upon the gasoline-only powered V-6 Avalon’s estimated 22 mpg city and 31 or 32 mpg highway (depending on trim level), making the hybrid Avalon a best buy that could possibly pay for itself. 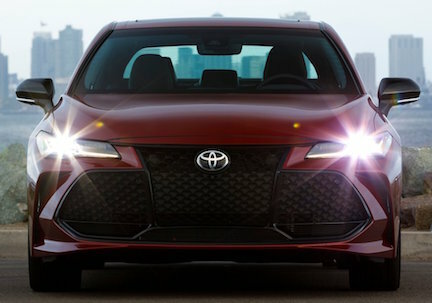 While the new Avalon is a significant departure from the outgoing model and Toyota has high hopes for increased sales, sedan sales of all makes continue to face severe headwinds and continue to fall. Even traditional best sellers like the Toyota Camry and Honda Accord – both excellent new sedans – are struggling, as buyers can’t get their fill of crossover and sport utility vehicles. 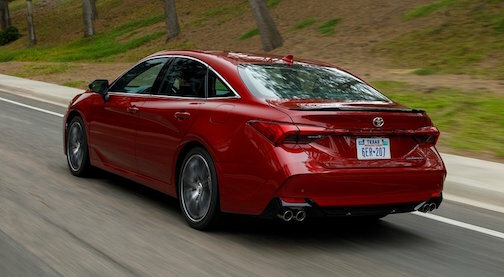 Still, Toyota is convinced there’s a still a viable Avalon market for aging boomers and early Gen Xers that want to drive a big, roomy premium sedan that looks great and is loaded with standard content without having to spend the big bucks for an Audi, BMW or Mercedes-Benz mid-sized sedan. Hybrid: 2.5-liter four-cylinder and Toyota Hybrid System II electric motors net 215 horsepower with Shiftmatic Continuously-Variable automatic transmission.